What is the educational value of Osmo Masterpiece? Masterpiece teaches drawing and creative confidence. It leverages Osmo to turn your iPad into a drawing tool. With Masterpiece you'll get the proportion and perspective of your drawing exactly right. The only limit of what you can draw is your imagination! Do you have instructions for Osmo Masterpiece? How do I add my own pictures in Osmo Masterpiece? Masterpiece has the ability to access your camera roll if you've allowed it. To use files from your computer, you can sync photos from your computer to your iPad, and they will show up in Masterpiece when you click the folder icon. Which image formats does Osmo Masterpiece support? Masterpiece will export PNG files for the complete images to the camera roll. From there you can export them off the iPad or do whatever else you want. You can also share the image and the time lapse video and download them through email. Videos are in the MP4 format. Can I save a drawing in Osmo Masterpiece and return to it later? If you are half way through a drawing, the history should store the drawing you were working on and the last size you were using. The history is the far right option in the image selection screen. It won't save the line settings, but that's not too hard to put where you want it. The hard part is aligning your incomplete drawing with the outline, but it's doable. How do I change the size of the picture in Osmo Masterpiece? To change the size of the picture, you'll want to press the blue hand icon in the bottom middle of the screen, then use your fingers on the screen to adjust it. Can I use Osmo Masterpiece to create large drawings? The Masterpiece drawing area is about the size of standard printer paper (8.5x11 or an A4). You can draw on a larger area by drawing on the visible area, moving the paper and reference, then realigning it. This technique will allow you to draw on whatever size you want to, but it's a bit advanced and still only lets you focus on one area at a time. Can Osmo Masterpiece be used for handwriting practice? We do provide English handwriting templates in the Masterpiece app. How do I enable search in Osmo Masterpiece? To enable search, please log into myOsmo and click on the Account link on the left. Then click on the Games link on the left and scroll down to view or change Masterpiece settings. How do I download Osmo Masterpiece images and time lapse videos? When you're finished with your drawing, press the checkmark at the bottom right of the screen. The app will take a final picture and also generate a time lapse video of the drawing process. Both your image and the time lapse video will be saved to your camera roll. You will also be given the option to share the image and the time lapse via email. It's worth noting that Masterpiece will only generate a time lapse video when you've drawn for at least a couple minutes, otherwise, it won't have enough data to actually make a video. How do I delete videos in Osmo Masterpiece? To delete a video in Masterpiece, please tap on myCreations button, tap on the image corresponding to the video that you want to delete, then tap on the trash bin icon in the bottom right corner. How do I combine multiple images in my drawing (like in the Osmo Masterpiece promotional video)? Combining images in Masterpiece is simply a matter of drawing the first image, going back and selecting the next image you want to draw, then drawing that on the same paper. Use the blue hand to transform images as needed. See the Osmo Masterpiece YouTube video here. How do I get fewer/more lines in Osmo Masterpiece? Press the settings button and drag the slider. Why are the lines for photos I take not very good in Osmo Masterpiece? 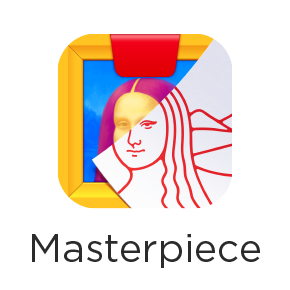 Unclear/blurry lines in Masterpiece are usually due to poor lighting. If your subject is backlit or doesn't have a lot of detail, then there are simply fewer lines in the image for the app to find. If you can, get your subject lit well or try standing closer or farther away. How do I get better lines for an image in Osmo Masterpiece? Press the purple filter button in the bottom middle of the screen (three lines and a circle). Drag the slider to change the number of lines. If these are still no good, press the droplet icon, which will give you completely different lines. Depending on the picture, these can be a lot better even if they are more difficult to draw. Lastly, if you just want the original image, press the icon on the far right. What do I do when the paper keeps moving while playing Osmo Masterpiece? The first step to keep the paper from moving is to put the top of the paper underneath the Osmo stand. This will often be all you need. It also helps to try to keep your hand/wrist on the table/paper while you're drawing. For younger children who have a lot less control and much smaller hands, we recommend taping the corners of the paper down to keep the paper from moving at all. Another option would be to use the Osmo Creative Set with the Creative Board, which has been specifically designed for Osmo's computer vision technology, the markers were also picked from a massive assortment as they work best with the technology ensuring you have the best experience. I just finished my first Osmo Masterpiece drawing, and it isn't very good. What am I doing wrong? Absolutely nothing! It can take a little while to get used to drawing like this, and as with anything, practice makes, well... better! For most users, mastering how to interact with the app is rather quick and in 5 to 10 minutes most people start to feel a lot more comfortable. Don't get discouraged; you'll be a master in no time! I'm getting 'No full image found' error in Osmo Masterpiece; what can I do? That message will pop up when we try to load the full resolution image, but something goes wrong. This can be caused by a couple of things. Some images are inherently broken (they shouldn't have been returned by the search engine in the first place); this is uncommon. Loss of internet connection: the device can no longer connect to the internet at all. If you still have working internet and you can perform more searches, then this is also not the case. Restricted internet: the app will go to whatever website the image is from; if you are on a restricted network, it may have access to our server and to bing.com (where the thumbnails are stored), but may not be able to access the actual site because it's blocked by the network. On school networks this may sometimes be the case. How can I see my child's drawings from Osmo Masterpiece? You can press the "Configure sharing" button in the lower right corner, and add your nickname and email address. After completing drawings, the child can tap 'Share' to send them to you. Print them and put them on the fridge! What happens when I (or my child) submit a Osmo Masterpiece creation to the community? When a user presses the Submit button, the account owner (the email listed for the account) will get an email asking for approval for sharing to the community. If you don't press the Approve button, then that drawing+video will never be shared. Nothing your child shares to the Osmo community will actually go anywhere, unless you approve the drawing or you've set your account to always approve drawings. Note that this doesn't have anything to do with sharing through email. To change the permissions/email settings, please go to my.playosmo.com, hover over your account name in the top right corner, select 'Account', then click 'Games' on the left, and look under 'When your child submits a piece of artwork to the Osmo community'. The default value will be 'Email me for permission every time'. If it's not set to that, then someone changed it at some point (probably through a link in an email). Also, we manually approve all drawings, so nothing your kids submitted would go directly to the community. If there's some specific drawing your kid has submitted that you approved and would like to remove, please send a link to us at support@playosmo.com, and we'll remove it. Why should I get the Creative Set for Osmo Masterpiece? Using the Creative Set with Masterpiece opens it up to an entirely different type of play. It encourages users to practice the broad strokes instead of focusing on details. It becomes more inviting to junior drawers and helps build their creative confidence. It's also nice to not waste so much paper. The Osmo�Creative Set combines creative tools, games and cutting edge technology to foster creativity and problem solving skills. The Creative Board has been specifically designed for Osmo's computer vision technology, the markers were also picked from a massive assortment as they work best with the technology ensuring you have the best experience.